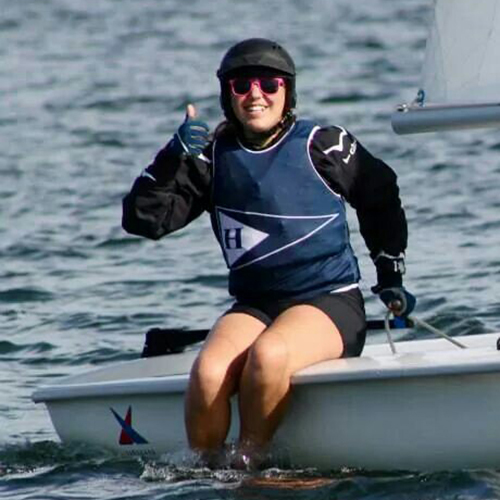 You can spot Kathryn Shiber (also known around Oakcliff as Kat) on the water by her black helmet, which she wears religiously while sailing due to many concussions. Kathryn was introduced to the sailing world by her aunt, and she encouraged her to join the Junior Sailing Program at Nyack Boat Club. She became hooked immediately. During her time in the Junior Sailing Program at NBC, Kat began sailing in Optis and Laser Picos and later transitioned to racing 420s, Lightnings, and Sonars. Kat currently attends the Hotchkiss School in Lakeville, CT; she chose to attend Hotchkiss for their well-known sailing program, which she is now a skipper for. Kat heard about Oakcliff through former Acorns and applied to Oakcliff to expand her experience outside of the local dinghy circuit. While at Oakcliff, Kat will participate in the Inshore and High Performance Dinghy sessions. Kat is excited for US Sailing team members to coach her, so she can improve her skill set and compete on both the national and international levels. During her first summer at Oakcliff, she began match racing and currently races 420s for the Hotchkiss school. her goals are to compete in college sailing, The World Match Racing Tour, study Mechanical Engineering, and work on boats for the rest of her life.